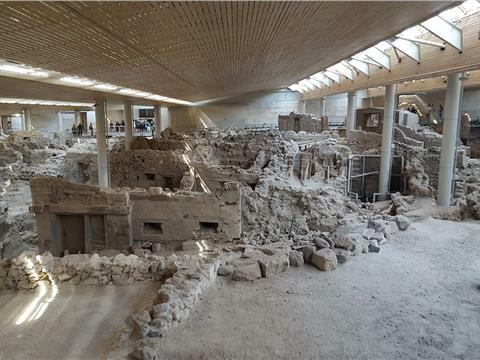 An amazing experience awaits visitors at Akrotiri village. Join a guided tour to one of the most important Minoan Bronze Age settlements of Greece, which has been preserved in a very good condition after it was buried under the volcanic ash of one of the greatest volcanic eruptions in history that hit the island in the 17th century BC. You will walk around a well-preserved prehistoric city along with an licensed English speaking guide. Entrance fee (€12/person) is not included in the price. Pickup info: Approximate pick-up times: Oia – 10:45 am. Imerovigli 11:05 am. Firostefani Ag.Gerasimos 11:15 am. Fira 11:30 am. Karterados 11:20 am. Perissa 11:30 am. Kamari 11:00 am. Return details: Return transfer to all destinations except Oia. Clients from Oia, the drop off is at Fira.